Following on from an amazing weekend of family and corporate events, our Clowns Bo and Noddy, are mad busy blowing up more balloons and getting all the fun stuff ready in preparation for the National Ploughing Championships 2013. 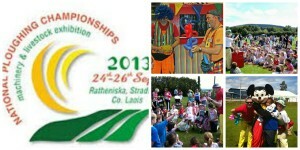 This year all the family fun is taking place in Ratheinska, Stradbally Co Laois on September 24th 25th and 26th. We are very excited to be taking part! Do come along and join in on all the fun! We’ll be in the DoneDeal.ie tent – stand: 349, Row: U, Block: 4 from 11am to 3pm. We’re going to have so much fun with circus tricks and balloon models tricks and gags! Do stop by and say ‘Hi’ if you’re coming along. We’ll have a special souped-up and Really Grand Balloon for everyone who stops by with a facebook or twitter ‘Hello’! I’d best get back to it – that Noddy is taking all the good balloons on me! !